In the last posting we discussed the mechanics and physiology of our physical form. Now we will consider the components of our energetic and subtle anatomy that surround, interpenetrate, inform and enliven that physiology. Each of these components works in connection with the other and all are important dynamics that insure the health and well-being of our physiological state. In fact, the state of dis-ease usually begins within the subtle bodies and eventually works it way out and into our physical level becoming manifest as a disease process. This is the underlying principle of the mind being able to heal or produce the state of health we choose as our focus. The mental working in tandem with the emotional is potent in its ability to manifest, both positive and negative energies within our physical body and each impact and interact with our subtle energy. Another component of our energetic physiology is that of the impact these subtle energies have on the physiologic Endocrine system. The seven glands, often referred to as the Seven Stars or the Seven Gates play a major role in spiritual development in accord with our ability to stimulate and engage them at a spiritual and energetic level. Notably, in the spiritual practices of Tibetan Buddhism and Egyptian High Alchemy, specific exercises and/or sound are used to stimulate these centers: the gonads, the liver and spleen, the adrenals, the thymus, pituitary and pineal glands. We’ll take a look at these in future postings. The Chakras are the conduits through which universal energy flows in and through us. They are represented as wheels or vortices that are positioned along the etheric central column pathway that parallels our physical spinal column. These gateways contract and expand opening and closing like the petals of a flower. They are often compared to the Lotus, each having a specific number of petals in accord with the vibratory rate they emit and respond to and in accord with the level of refinement. 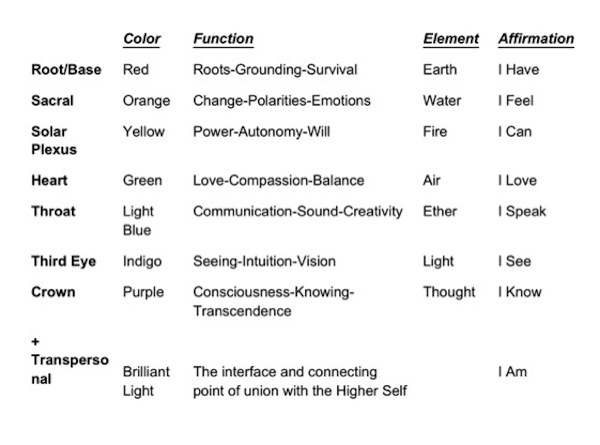 Additionally, each of the seven chakras have a specific tonal quality. 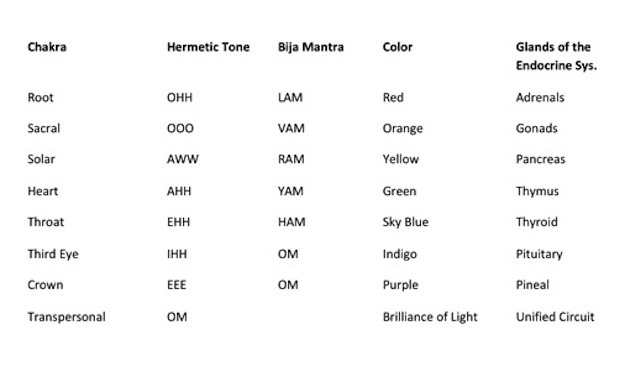 The chart below lists the Hermetic tone and the Eastern Bija mantras that are associated with each chakra. 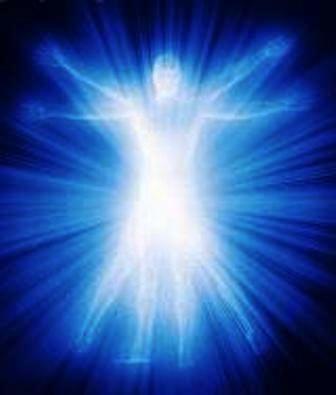 The Nadis and Meridians are highly specialized energetic pathways that run in multiple directions throughout our body. It is these pathways that Chinese Medicine, Accupuncture, Accupressure and other healing modalities make use of by way of stimulating the flow of Chi energy to move in a non-restricted and healthful pattern. 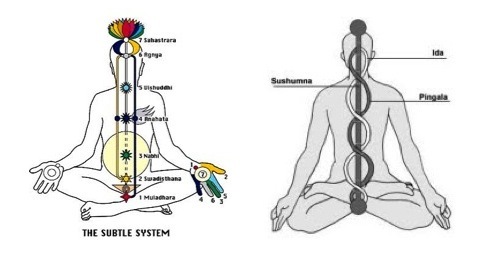 The Nadis are highly specialized and localized pathways that align with the Chakras and act upon the energy flow moving up the central column, inclusive of the spine, spinal fluid, and the nerve bundles. In the Eastern Kundalini Yoga practice the Nadis and the rising of the Ida and Pingala coiling up the Sushumna is the serpent fire that opens the awareness of the practitioner to union with his/her Higher Nature. The Ida is the lunar (Feminine) energetic path and the Pingala is the solar (masculine) energetic path. The union achieved at the Crown chakra is the product of the combined polarities of moon and sun, feminine and masculine giving birth to the Divine Child of your Higher SELF. The Meridians are the pathways of the body that help to regulate and maintain a balance of flow from organ to organ. 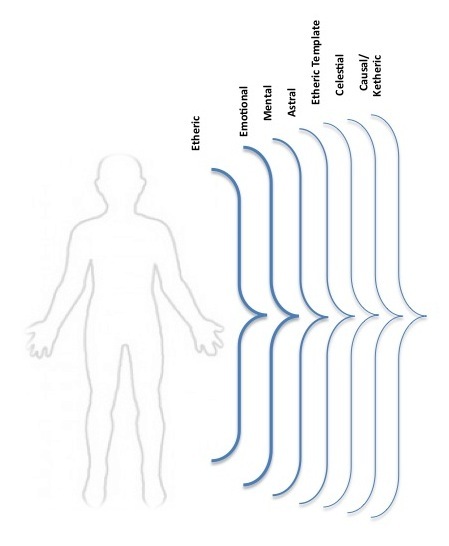 Each major Meridian or channel is responsible for a specific organ and their surrounding structures. The Meridians play a major role in Traditional Chinese Medicine and the treatment of dis-ease, thought to be cause by a disruption of the natural flow of the Chi within the body. When you feel energized and have a sense of balance, beginning at the transpersonal chakra, see this energy slowly dissipate as each globe clears and returns to a state of transparent glass. Move downward from one sphere to the next. Each in turn fading in brilliance, returning to its resting state of transparency and size. When you have returned to the root chakra and the spheres are once again clear pure transparent glass, chant a sustained “ OM “ to complete the working and coalesce the rate of vibration within each of the chakra columns in each of the subtle bodies. If you’ve done the meditation above, or something similar, various sensations were sure to arise. Learning how to maximize the physiological sensations as tools of information received from the spiritual experience is a necessary point of focus if you want to gain greater insight. This next group of posts will focus on the five overt senses and their function in esoteric work. A companion post will be available in the Magickally Human blog that focuses on the physical presentation of these senses and the awakening of their awareness to be fully present in both mundane and spiritual endeavors. This entry was posted in Awareness, Energetic Anatomy, Overview and tagged chakras, energetic action, energetic body, energy practice, meridians, nadis, renewal, subtle bodies, the Divine human. Bookmark the permalink.